Keels will be laid today for the new aircraft carriers Spaun and Yorck; these two vessels are but one more milestone in the growth of the Kriegsmarine. The largest aviation ships yet constructed in Germany it will take some four years for them to be completed, but their eventual arrival will give our fleet unprecedented capabilities. Following successful testing of a new intermediate cartridge (Mittelpatrone) developed by the Polte Armaturen und Maschinenfabrik of Magdeburg the Army Ordnance Office has issued requirements to industry for submission of rifles intended to fire the new round. Little information on the nature of the specifications in available at this time, but there is speculation that a new type of automatic weapon, potentially replacing the machine pistol, is desired. Walter Schellenburg awaited the call to board the Junkers airliner that would carry him back to London. Unlike previous visits home, this respite from his embassy duties was filled with debriefings and briefings, nearly filling his mind with more information than he could remember. He could now make sense of some of the reports he had received but not fully understood – the cryptic references to ‘piles’ gave clues to British development of atomic reactors, and ‘winscale’ was in fact a reference to factory in the far north-west of England – Windscale – where research work was being carried on. He had been enjoined to redouble his efforts to penetrate the veil of secrecy that lay over the British efforts, and he focused his thoughts on how that might be accomplished. The ships of the East Asia Squadron headed down the harbour channel towards the open sea, and aboard his flagship Konteradmiral Bernhard Rogge allowed himself a small sigh of relief. The temptations of Manila had proven attractive for some of his sailors, and reports of the captain's mast hearings were spread upon the desk of his day cabin. Thankfully none of the incidents were too serious, but Rogge looked upon them as a black mark on his squadron. With full bunkers and sea room he could exercise the squadron to take the crews’ minds off other matters before returning to Indochina. The air defence cruisers Lissa and Saida have called here upon completion of the first phase of their builders’ trials. Completed Thursday of last week, the ships have put in to take on supplies and to correct some minor deficiencies before returning to sea for the next phase of their trials. They are expected to continue their trials period for several more weeks before beginning operational training and working up exercises. Newspapers were stacked up on his desk when Walter Schellenburg re-entered his office; he would read them later, and cleared a space upon which to work. He had to arrange meetings with several of his ‘Baker Street Irregulars’ – now that he had a better understanding of what questions to ask, he would need to convey this to them and to investigate – if possible – the Windscale factory somewhere in the north of England. 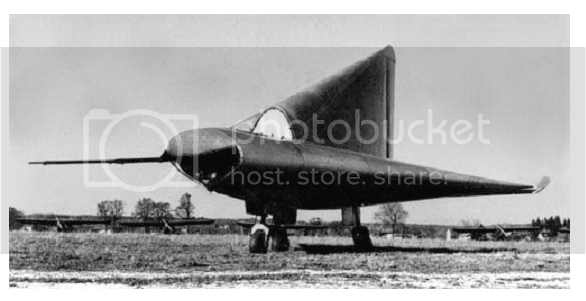 And then there were rumours of a new heavy bomber being developed for the Royal Air Force – the Luftwaffe was quite keen to get information regarding its capabilities, and while press clippings might answer for some of it, Schellenburg knew that he would need to dig deeper. There was far too much to do, and he cursed that the need to maintain security denied him an assistant to help carry the load. For the first time in a long time Otto von Hapsburg had come away happy from a cabinet meeting. With the departure of his opponents he had won approval for a limited liberalisation of German economic policy in Europe. He had directed his staff to begin preparation of new policy memoranda for consideration, items that would soften the hard-nosed approach to economic cooperation. It was not so much a question of what would be sought but how ends might be achieved, and how true partnership could replace what too often seemed foreign exploitation. There would be further discussions with the Chancellor and the Cabinet, but von Hapsburg believed they could be overcome. The Ardeltwerke of Eberswalde delivered the first example of its Leichtepanzer "Lowe" to the Heer for troop testing. The vehicle is question is one of a small batch constructed prior to the placement of the official order last month. The company has invested significant sums in expansion of its production facilities and further investment is anticipated. Further details have been released by the Ministry of Defence regarding the structure of the First Armoured Cavalry Regiment now forming at Döberitz. The regiment will comprise three combined-arms squadrons fielding tanks and panzergrenadiers integrated at the troop level, its own mechanised artillery and pionier elements, and a full complement of medical, supply, and signals units. Of particular note is the plan to include an organic aerial reconnaissance and support troop utilising helicopters. The ships of the East Asia Squadron had returned to their accustomed anchorages in the finest harbour in all Indochina. For the crews the return from sea meant that their attention would be turned to maintenance of the ships – painting, polishing bright work, and all the myriad of things that had to be done to keep a warship in fighting trim. Some lucky sailors, whose enlistments were soon to expire, would begin their travel homeward by air and sea; the empty berths aboard the cruisers and frigates would soon be taken by replacements. Some of the officers would also be returning home, to take command of the new vessels coming out of the shipyards or to fill senior posts on them; the traditional ‘hail and farewell’ parties would fill wardrooms aboard ship or restaurants ashore. Such was the rhythm of overseas service. The Österreichische Metallwerke has acquired the stock of Aluminiumwerk Unna AG, a producer of aluminium alloy shapes and sheet, increasing its share of the growing market for this commodity. The Ministry of Defence has announced that as of 1 April new pay scales will go into effect for the Heer, Kriegsmarine, and Luftwaffe. The new pay rates represent an approximate three percent increase in basic pay, intended to encourage re-enlistments and retention. “Herr Chancellor,” said Dehler, the Foreign Minister, “I have received a second note from the Italian ambassador protesting, as it reads, “Germany’s wilful arming of power unfriendly to Italy and further destabilising the balance of power in the Balkans”. “Yes Herr Chancellor,” Dehler replied, with muted exasperation in his voice. “The Palazzo Chigi is fearful that the lease agreement is a precursor to an outright sale of large numbers of the aircraft”. “And they are fearful that we would want to absorb the Südtirol,” Dehler added. Otto von Hapsburg, the Minister of Economics, suppressed a laugh. “A thief,” he thought, “is always afraid that a stronger thief will come along to take his prize”. Resignedly Adenauer directed Dehler to reassure that Germany was not contemplating any significant armament sales to Yugoslavia, or to any of Italy’s other neighbours. The report from the Middle East desk lay upon Gehlen’s desk. He allowed himself some minutes to contemplate the situation it described. While Palestine lay quiescent for the moment, the British efforts to force a renewal of the Anglo-Iraq Treaty had generated a backlash of Arab nationalism. Gehlen had no great love for the British, but he had less love for chaos – and unless those tasked with resolving the Iraqi situation acted swiftly and wisely chaos seemed a likely outcome. Germany still obtained much of its oil supply from Persia, Iraq, and Arabia – all of which could be caught up in a regional conflict. Persia had officially foresworn its expansionist ambitions but Gehlen had no illusions that should the Iraq boil over Persia would become involved in some way; and Bharat lingered in the background as well. He wrote a quick memorandum directing that intelligence-gathering efforts in the region be redoubled, and then routed the report to the Foreign Ministry, who no doubt would draw its own conclusions. The scientists aboard the Goldener Löwe watched their instruments intently as the helium-filled balloon slowly rose into the sky. It carried aloft an improved scientific sounding rocket, one which they hoped would launch without failure; thus far their expectations were being fulfilled. All eyes were on the altimeter reading from the balloon; as it reached the pre-set altitude the rocket firing circuit was triggered – and they were rewarded with the announcement from the ship’s DT operator that they were tracking the rocket as it arched upwards and eastward. Soon telemetry data was being sent, giving the scientists their first solid clues of the hazards of flight above the stratosphere. The air defence destroyers Hamburg and Berlin have completed their operational training and will depart tomorrow to join the Atlantic Fleet at Wilhelmshaven. The second of hydro-electric power station of the Ostmärkische Draukraftwerke AG, at Kellerburg, was completed yesterday, and joins the recently finished station at Lavamünd. Each of the completed stations are expected to generate forty megawatts of power once testing is completed; it is expected that the units will come on stream in the early spring. Construction continues on the larger units of the scheme. Jagdgeschwader 25, at Berlin-Gatow, has begun conversion to the Bf329 jet interceptor, replacing the unit’s complement of Focke Wulf Fw190D aircraft. It is expected that other units will begin conversion to the new type as production ramps up. The air defence destroyers Osnabruck and Dortmund were completed today in the Deschimag shipyards at Hamburg. They will now embark on their trials and working up, and are expected to join the fleet sometime before summer. “Cast thy bread upon the waters: for thou shalt find it after many days,” Schellenburg recalled the passage from the bible. The calculated kindness he had shown in helping the former porter, former spy, former beggar Aston had paid off. On his desk was a photograph – he did not know exactly how it was obtained – taken in the public house wherein Aston worked. It was a group photograph of those who worked at the Risley research facility – and he recognised one of the more prominent men in it – the scientist Christopher Hinton. Berlin might be able to identify the others – which would add to their knowledge of who was engaged in Britain’s atomic research work. The aircraft carriers Tegetthoff and Zieten were completed today at the naval dockyards here; the ceremonies marking their completion were attended by many dignitaries, including the Minister of Defence, Herr Blank. Both vessels now enter their trials and training phase and are expected to join the fleet in the early summer. Located at the crossroads of the Middle East Iraq had a long and troubled history, and Persia, back by Bharat, had fished those waters for many years. Might the latest upheavals there tempt them to try again? Or would they continue their pacific policies? ‘Murky’ was a word Gehlen did not appreciate; he desired clarity in all things. The protests seemed to have spread from intellectuals to students in favour of outright independence, but there were reports that even the common poor of Baghdad had involved themselves – with so-called ‘Communists’ in the vanguard – at least according to the reports his officers had sent. He picked up the scrambler telephone on the direct line to the Minister of Defence. Precautions were called for. Konteradmiral Bernhard Rogge read the warning order from the Admiralstab with grave concern. He was to prepare two frigates to deploy to the Arabian Sea. The situation in Iraq was beginning to boil and Berlin wished to have eyes on the situation. Not that two frigates could do much; but they could send a message. Rogge wondered what that message might be, for the instructions provided quite preliminary. After ten days on station and conducting three successful tests of the forschungsballon sounding rocket, the Goldener Löwe was headed home. The scientists aboard were already busy poring over the data they had obtained about the upper atmosphere, and it was quite clear that the fixes made to the apparatus had cured the problem of launch failures. The programme of upper atmospheric research could now proceed unhindered. Or so it was believed. The residenz in Stockholm had forwarded a report distilled from information obtained from Nordish sources on industrial developments in Bharat. The pictures that accompanied the text – and they were obviously taken with an eye to propaganda – confirmed the main thesis of the document. Bharati industries were a study in contrast – with many workshops relying upon artisanal labour yet with modern factories a growing part of the Bharati scene. 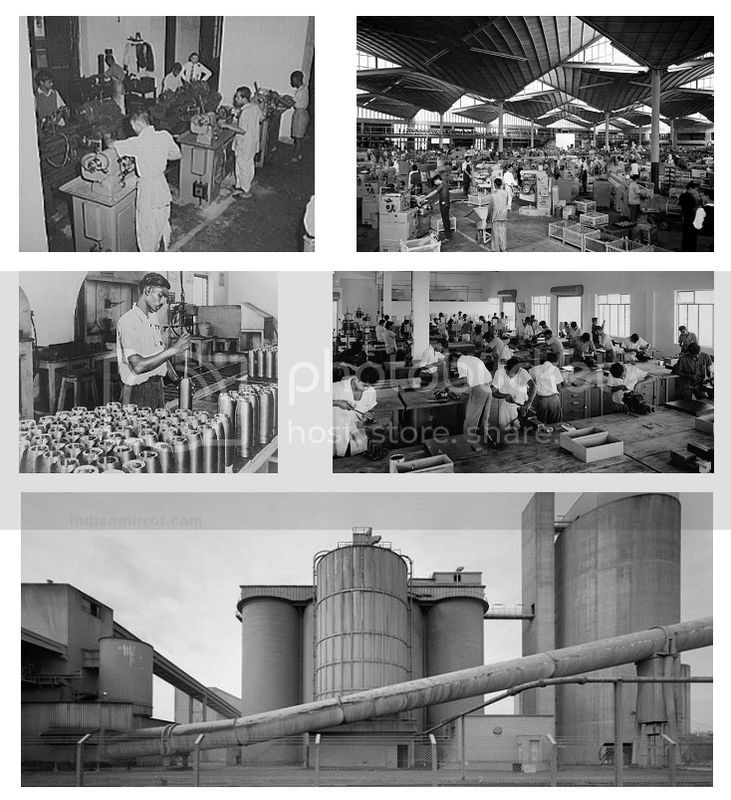 While some Bharati technology was leading edge much of its industrial capacity was still mired in the past. The Ministry of Defence has approved the sale to Argentina of a small number of Auto Union Typ 166 amphibious all-wheel drive vehicles and a larger quantity of Krupp SGA-type amphibious all-wheel drive cargo carriers. Deliveries are expected to commence in the spring and be completed by autumn. Otto von Hapsburg pondered the discussions at the cabinet meeting the previous day. Dehler had informed it that by all reports the power of the Left was rising in Italy, with a series of small strikes crippling the output from Italian industry. The statistics of his ministry told their own story – Italian industrial production was down more than five percent, and the lira was depreciating at a rate that had bankers worried. While German firms were able to take advantage of the unfortunate circumstances impacting their Italian competitors to increase their exports, the fall in the lira made repatriating profits difficult. No wonder the Italians were concerned about arms sales to Yugoslavia. Could the present Italian Government survive? To von Hapsburg is was a very good question. Konteradmiral Bernhard Rogge stood on the bridge of his flagship and watched as salutes were exchanged with the frigates Gefion and Hela, which were departing in company with the tanker Lech. They were under orders to head west to the Arabian Sea, to be present if any intervention to protect German interests in Iraq might prove necessary. Rogge had misgivings about the orders from the Admiralstab, and had ordered his captains to take particular care not to offend British interests. Their cruise was to be measured, in the hope that Britain might be able to resolve the crisis without resort to force. Nevertheless, he had ordered drawn up a contingency plan should intervention prove necessary, and had inquired of his French and Russian counterparts what actions, if any, they contemplated. Nevertheless, he had ordered drawn up a contingency plan should intervention prove necessary, and had inquired of his French and Russian counterparts what actions, if any, they contemplated. -- Russia has every confidence that the British are capable of keeping a lid on Iraq; whether Britain finds it convenient or not is still up for debate. The Russians have no contemplation of activity in regards to Iraq, because there is no clear necessity for it; if there was necessity, Russia preemptively declares "not it!" However, the military dusts off and updates their maps so that they have some idea where Baghdad is, just in case they need to flatten it with Myasishchevs. -- France has concerns about regional instability spawned in Iraq spreading and affecting other powers in the region, but doesn't see any pressing need to interject themselves into an unwinnable situation for the lols. In other words, Russia and France say: "It's somebody else's problem." Details have been released of the most recent project of Doctor Alexander Lippisch of the Luftfahrtforschungsanstalt Wien. An unpowered glider, the single-seat craft has a length of 6.32 meters, a height of 3.25 meters, and a delta-planform wing spanning 6 meters, with a total area of approximately 19 square meters. Its empty weight is 375 kilograms, and its gross weight 460 kilograms. In extensive testing at the Erprobungsstelle Rechlin near Berlin it achieved a maximum glide ratio of 7:1. Doctor Lippisch is presently engaged in the development of a high speed research aircraft for the Luftwaffe, the prototype of which is expected to fly later this year. Despite the signage that proclaimed the municipality as Brennero the vast majority of the inhabitants still thought of their town as Brenner; only the police, postmen, and school officials spoke Italian out of habit – the locals preferred their Austrian-derived dialect of German. Thirty years ago the Italians had arrived, in the wake of Austria’s defeat in the Great War – and they had stayed since, hoping that they could persuade the residents to think of themselves as good Italians. And for a time, this had worked. But in more recent years the once-friendly relations between the newcomers and the residents had devolved into a quasi-colonial environment where white-collar jobs invariably went to Italians while residents were left to their farms. Schools taught only Italian; German and Ladin were forbidden. But the worst part was the arrival of the criminals – Neapolitans and Sicilians – who had moved in as ‘credit sharks’, ‘pressers’, and thieves who preyed upon the railway wagons that moved south through the Brenner Pass from Germany to Italy. They had once been kept in check by the authorities, but had grown bolder with even senior police officials in their pockets. Keels of the last pair of air defence cruisers on order for the Kriegsmarine, the Szina and Temesvar, were laid down today – the former at Kiel and the latter at Cuxhaven. Intended to screen carrier task groups against air attack, these vessels are expected to complete in the spring of next year. The Commercial Registrar reports the formation of a new firm devoted to the development and manufacture of plastics for commercial building applications. Known as Rehau AG the firm will exploit patents owned by the founder, Helmut Wagner, with the financial backing of the Commerzbank. M. DuMont Schauberg KG has introduced illustrated news magazine aimed at German women, to be known as Für Sie. The magazine will report on trends in fashion, beauty care, fitness, and wellness. Ideas on house decoration and celebrity interviews are expected to be included as well. For the men of the frigates Gefion and Hela, their mission to the Arabian Sea was a welcome change to their normal routine, though their officers looked upon things differently; if things truly blew up in the Persian Gulf two frigates would be able to accomplish little. In the wireless rooms of both ships a round-the-clock watch was kept- not only for communications from the Admiralstab and Radio Berlin, but the British BBC was also monitored. Together with the tanker Lech the ships slowly left the Dutch East Indies behind them and shaped a westward course. In an unexpected move the Wiener Bankverein has acquired a one-third interest in the Moravian-Silesian Electricity Power Plant at Třebovice and the North Bohemian Electric Power Plant at Podmokly through the purchase of new shares of the Czech properties. It is expected that the acquisition of the shares will give German firms the inside track to supply equipment needed to expand Czechoslovakia’s thermal electric power supply. Reinhard Gehlen drummed his fingers on his desk; it was quite clear that things were happening in South America, but they could be interpreted in several ways. The detente between Peru and Chile was a hopeful sign, but the increasing number of terrorist incidents on the latter’s border with Bolivia suggested that a new threat to peace might be emerging. More worrying was Argentina’s apparent desire to develop the amphibious capabilities of its navy – which made for good business on the one hand, but which might easily be interpreted as presaging a return to confrontations with the South Africans. Personally, Gehlen did not care if the South Africans took one on the chin from the Argentines; professionally however he thought such an outcome unlikely unless foreign powers were drawn into the fight. He drafted a directive to his stations in South America seeking more information. Schellenburg read the report from his agent Walser with interest. The man played cards frequently with friends at the Portland Club, where he was able to pick up useful titbits of information, and Walser was particular adept at using the fixer Sidney Stanley; the latter still claimed to have important contacts inside the British Government. Through other sources Schellenburg was aware that pressure was mounting on the Government to do something; the Conservative press was using phrases as “teaching the Iraqis a lesson”, while there had been small left-wing demonstrations in support of the embattled Independence Party. Walser’s report continued. Schellenburg nodded. He encouraged his ‘Baker Street Irregulars’ to report on all they picked up. One never knew what might become important in the future. The Deutsch-Westafrikanische Handelsgesellschaft has long played an important role in the development of the Iberian colonies in West Africa, and their rubber plantations there are among the largest and most modern in the world. Seen from the air (top left) the complex offers a concrete example of how the quality of life of the indigenous population can be improved through foreign investment and application of scientific principles. The Harbel complex has direct river access (top right) and its output is sent by lighter to coastal ports for shipment abroad. 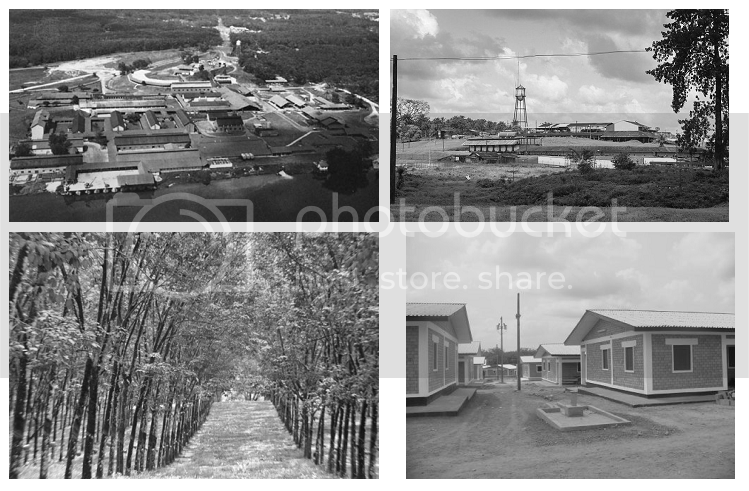 The rubber trees are carefully sited (bottom left) to assure their rapid growth to maturity, and provision is made for the health and welfare of the workers, who live in recently renovated housing blocks (bottom right) and provided with clinics, schools, and recreation facilities. The first production Dornier Do335 naval fighter aircraft was rolled from the Norddeutsche Dornierwerke factory at Wismar today and formally accepted by representatives of the Marineflieger. Otto von Hapsburg had returned from the day’s meeting of the Cabinet in a foul mood. Despite his ministry’s approval of the Weiner Bankverein’s acquisition of a stake in two Czech power stations the Leftist press had raised the issue and questions had been asked in the Reichstag; before the Cabinet he had been forced to defend the matter – and while he did so effectively, he was still annoyed. Too many uninformed people contrasted the move in Bohemia with his public stand against German investments in Poland and elsewhere in Eastern Europe; they failed to see that the power stations in question were vital to Germany’s own economy and their expansion necessary to fuel continued growth. Furthermore, the Czech government had acquiesced; thankfully, the matter had not broken before the elections. The recently completed minesweepers Hopfensee and Ploggensee have completed their operational training and work up despite winter conditions in the Baltic. Researchers at the Luftfunk-Forschungsinstitut Oberpfaffenhofen have announced completion of testing of a semiconductor device – the Transistron – which can be used to amplify or switch electronic signals and electrical power. Building on their earlier work in the use of germanium physicists Herbert Mataré and Heinrich Welker constructed a solid-state device that is expected to significantly improve the reliability and performance of a wide variety of electronic and communications equipment. The minesweepers Tietzowsee and Trenntsee were completed today in the city’s shipyards and are set to commence their trials and operational training next week. The rumble of the heavy low-loader transports announced the arrival of the convoy. To Oberst Paul Freiherr von Hauser its coming was music to his ears. For several weeks now his new command, the First Armoured Cavalry Regiment, had been receiving drafts of personnel and a trickle of the new materiel called for by the unit’s table of organization and equipment. Today’s convoy was bringing the first “Löwe” light tanks to be issued to the troops. The “Löwe” was reported to be fast and stealthy, though its gun could not hope to match the high velocity “88” on the “Panther”. Speed and stealth were the primary requirements for Hauser’s unit. To screen the advance of more conventional panzer troops, or to rush forward to secure an objective, or even to serve as a blocking force to slow an enemy’s advance. 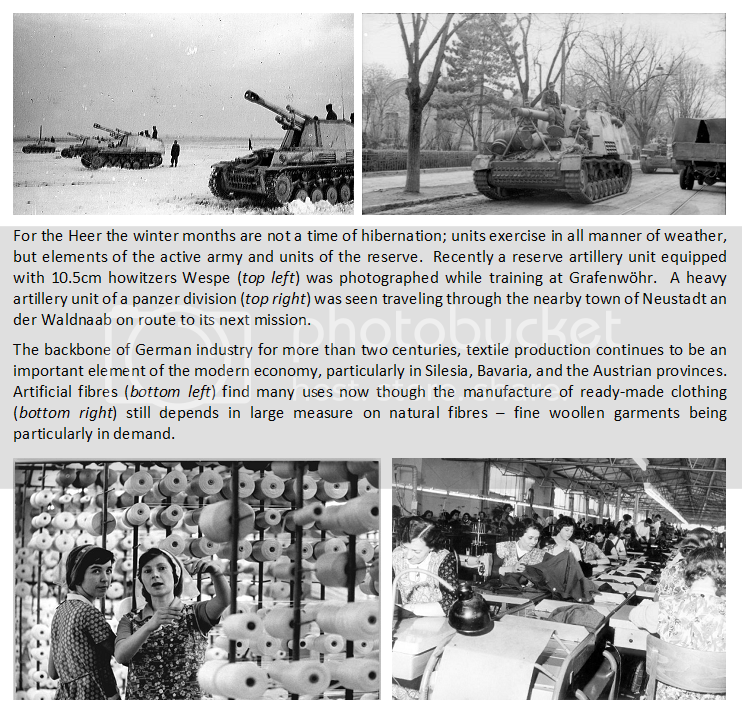 With the arrival of its first tanks Hauser and his command could get down to proper training; he only wished that he would receive his full complement before spring. Reports from Neustift im Stubaital, in the district of Innsbruck Land, indicate that daring criminals carried out a bank robbery in broad daylight Friday afternoon. Three masked men, two armed with pistols, entered the municipal sparkasse and made off with more than ten thousand Reichsmarks in cash. One official at the sparkasse suffered injury when one of the bandits struck him with a cosh. This is the first such incident within the district in living memory. Local police are investigating but thus far leads are few. The inspection ship Goldener Löwe arrived at her home port of Emden today, having completed a cruise to the South Atlantic, where she engaged in tests to investigate the composition of the upper atmosphere. The tests have been pronounced a success by the Reichsstelle für Weltraumforschung. Schellenburg read the item in The Times with interest; the monarchist government in Iraq seemed to be stabilising the situation despite the crackdown on Communist elements. Thus far, British forces had not had reason to intervene, despite calls in the Press that it should do so. As for the other matters under his remit, he was still awaiting a response from Berlin to the photograph of British scientists working at the Risley facility; no doubt it would come with the next courier – such important information would not be confided to signals that might be intercepted. His agent Walser had picked up a rumour out of Holland that Britain was contemplating improvements to its air defence warning system – supposedly the Philips firm had been asked to tender for valves and other material. The premise was sound enough, but Schellenburg wondered if the British would actually rely on a foreign source for such important work. The reports from the Admiralstab and the BBC World Service kept the officers of the Gefion and Hela on edge. To the continuing crisis in Iraq was now added the possibility of a coup in Yemen, where an attempt had been made on the life of one of the nation’s religious leaders. Chaos seemed to be burbling beneath the surface of the Arab world; as yet, however, there were no direct threats to German interests. Considered to be ‘on station’, sailing a slow, racetrack course, the German vessels awaited orders. The village postman entered the half-open door of the Gasthof Alpenrose and called out a cheery “Good Morning!” – which, to his surprise, was unanswered. He heard a low moaning coming from behind the counter, and as he went to look, found the proprietor, Herr Kunze, slumped on the floor covered in blood. The postman was duly thankful when he saw that Kunze still breathed – he stepped back to the door and sounded his post-horn to summon assistance, and in due course a constable arrived to take charge of the situation. Several hours and numerous stitches later Kunze was able to explain what had happened. Three men – strangers to him – had come in the early morning. One – the apparent leader – explained that Kunze would be paying a hundred Reichsmarks a week to assure that nothing untoward happened in his establishment. When Kunze tried to explain that there was no need for such insurance, as nothing ever happened at the Alpenrose, the other two men assaulted him. A report was sent on to Innsbruck, where it was added to a growing file. He put the papers down and considered the albatross hung around the neck of the Dutch Government. Saddled with a complex monarchical edifice which heretofore had almost unbridled authority politicians now had to find a means to balance the determination of the House of Orange to cling to real power with the growing demands of the African colonies for their own independence – to say nothing of the East Indies, where by all accounts separatism was gaining ground. Von Zech-Burkersroda considered the favour the victorious allies had done Germany by detaching her own colonial possessions in the wake of the Great War; and was glad that such problems did not cloud Germany’s situation. Its entry into the Grand Alliance with its continental and international partners assured its security in the face of England’s undying hostility. He hoped that the Dutch might see the wisdom of allowing the colonies to seek their own destiny. One-by-one the ship’s dependent submarines slipped their moorings and dropped down the channel towards the North Sea – the Asche, the Drachenfisch, the Hecht, the Huchen, the Maifisch, the Seeteufel – the process took more than two hours, giving the boats sufficient sea-room to manoeuvre and avoid potential collisions. Once in the open sea the boats would head for their patrol stations – exactly where, no one aboard the tender knew with any certainly.